As you may have figured out I'm a massive fan of anything retro futuristic. I love how everyone thought the future would look back in the mid 20th century. So very hopeful, stylized and clean. No wet, grungy apocalyptic society in sight. The Paleofuture blog over at Smithsonian.com just ran a drool inducing article. 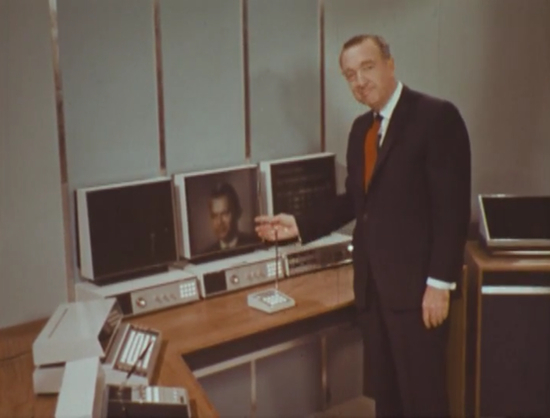 It's about an episode of Walter Cronkite’s half-hour CBS documentary program “The 21st Century.” In this particular episode he visits the home of the 21st century. In the year 2001 to be exact. If you want to see what 1967 thought 2001 would look like hit the link and check it out. Having been bested by the little pink toilet, I chose to battle a weaker foe: the basement toilet. 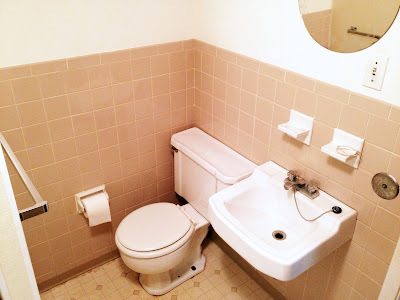 Quintessential to my swinging 60's finished basement resides a bland yet acceptable full bath. Slightly too short for me to shower in, but good enough for normal sized guests. 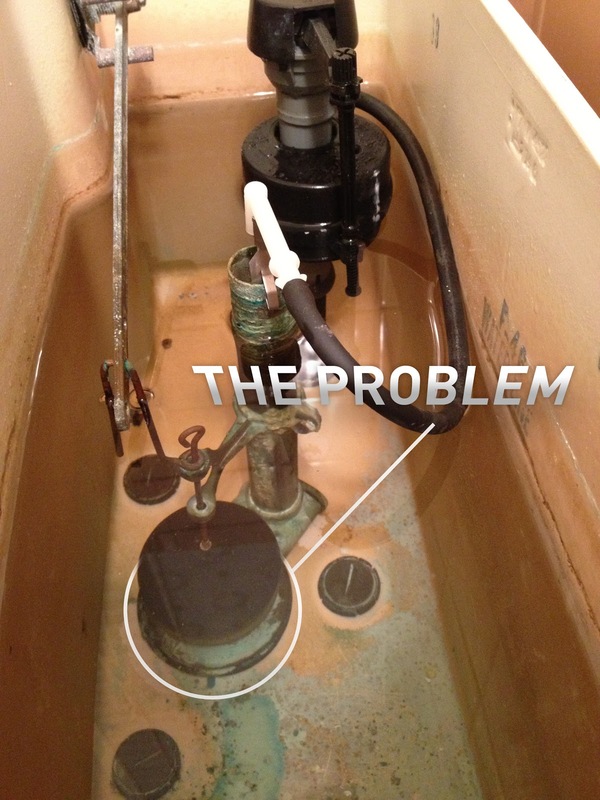 This DIY toilet repair project not only ended better than the other, it forced my home into revealing some intimate details. In fact right now I’m typing this as a very nice man from Roto-Rooter is doing god-knows-what to my sewer system. Black goo bubbling up from the ground was the proverbial line in the sand for me, so I'd called a professional. But I digress, lets get back to the initial repair. This toilet was squirting water out its rear end whenever you flushed. Funny, yes, but hardly convenient. 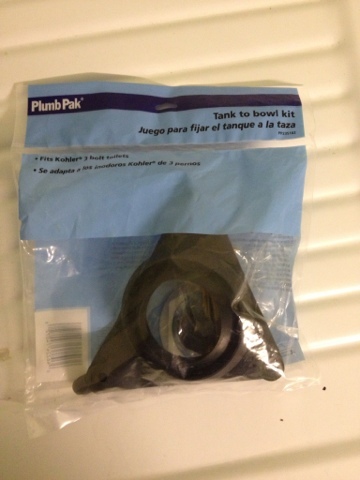 After some quick internet research I surmised the proper solution was to replace the tank-to-bowl gasket. Thankfully this time the water shut off worked. I drained the tank, took it all apart, and then took advantage of the opportunity to clean all those hard to get places. I discovered not only was the old gasket in really bad shape, but it was also the wrong kind of gasket all together. I have Kohler toilets and they all use a weird 3 bolt gasket setup (apparently since the 1940’s or so right up until today). I followed my nose like a terrified bloodhound into the attached laundry room. There before me was the source of the smell. A pitch black primordial ooze. It was as if a small black-hole had ripped open in my basement. I don’t care if Bugs Bunny pops out of that thing, it's still not good news. Here is where Roto-Rooter comes in. To my surprise they have a night and weekend service and they don’t charge extra. Big deal for a guy who’s down to his last pennies for a few weeks. Thirty minutes after calling I had someone at my house helping me out. Can’t say enough good things about Roto-Rooter guy. After explaining what he thought was going on he went to work fixing it. Never made me feel stupid for well, being stupid. In my mind, I’m positive my house is under attack by hoards of small gremlins chewing their way in through the deep, dark and evil underground, intent on ruining my life...via my foundation. That or some tree roots are wreaking havoc. I’m wrong though, I come to find out the previous resident had been flushing baby wipes and “feminine products” as he said. Pretty much a universally bad idea. Thankfully it was an easy fix for him and now I can say the score is tied Robert One, Toilet One. As I’m thinking of ideas for this blog, I had the notion to write a series of DIY posts for all the random repairs my house will require. Enlisting the help of friends, and 1961 Popular Mechanics Home Handyman Encyclopedia & Guides, I hope to lessen the cost of home ownership. So settle in, my faithful readers, as I regale you with tall tales of what happens when a guy who really has no idea what he's doing attempts to fix vintage tech. 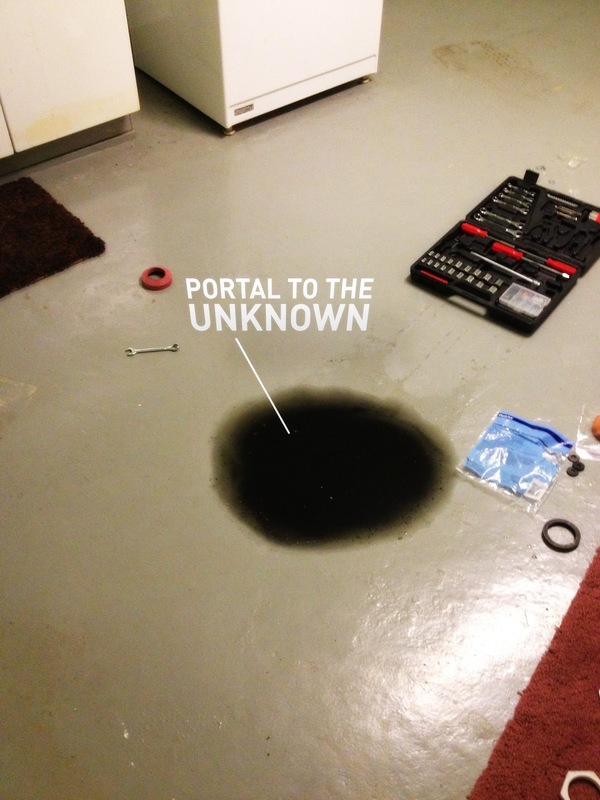 Let us begin with the adventure that is toilet repair. 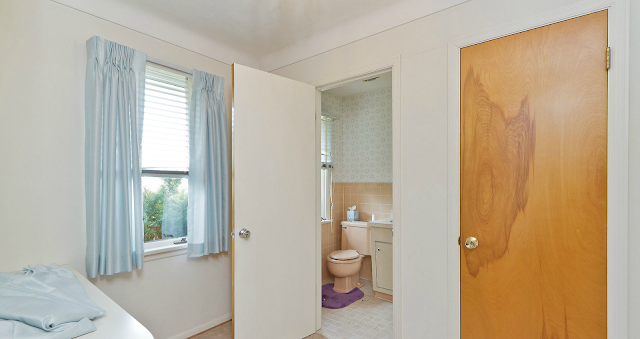 I have three toilets, two of which require attention. I chose to start with my half-bath in the front of the house, which is accessed via a small odd room I can only think to call the powder room. The half-bath besides being my homes' all important pink bathroom, is the closest toilet to my TV and God forbid I have to walk to the far side of the house during a movie. While reading about my DIY projects you will notice a common theme interwoven through all of them: What should be an easy fix is always anything but. Step one with toilet repair is shutting the water off. Of course, the water shut off valve is stuck open. Normal DIY enthusiasts would grumble and go to the hardware store for a new valve. Not me, I exist on a higher plane of wacky ingenuity. After my trusty PB Blaster failed to loosen the mineral crusted valve, I had the bright idea to rubber band the float in place so the toilet thought the tank was full. Once the water had drained and I was certain no more would be returning, I took out the at least 30 year old rubber flapper which in this case is really more of a ball on a stick. By the way, as some one who has never fixed a toilet before I didn't realize this was an antiquated system until I went on a desperate quest to find a replacement. 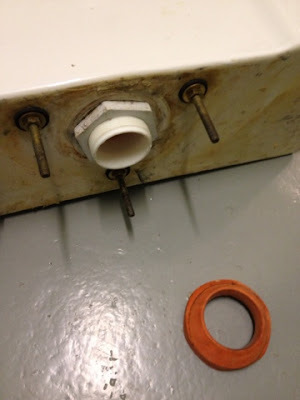 With the moldy old ball stopper out I could see chunky build up from the horrible blue urinal cakes it had been tortured with. Never use those, they really mess things up. I sanded the blue barnacles off the brass flush valve and installed the new ball. Upon releasing the rubber band, water jetted into the tank filling it to the suggested water line. I retired to the sitting room and impatiently waited to see if it would start running. Just as I started to pat myself on the back for a job well done I heard the distant tell-tale sound of water rushing to fill a leaky tank. My only guess is the gasket below the flush valve is leaking. The next step is to replace it and add one of the fancy dual flush systems while I’m at it. For now though the score stands at Robert Zero, Toilet One. I'm sitting here wondering where to start. I'm not a writer by trade. This doesn't come naturally. I'm an animator, tell me you need some pretty shapes moving around on a screen to make your long-winded scientific study seem interesting and Ill have it done lickity-split. Ask me to write said long winded scientific study and you will find me with with ten pages of doodles and nothing written past my name and a title. It makes one wonder why I would stumble down the strange and foreign path of blogging. Personally, I blame it on my house. It’s one of those “love at first sight” cliches. I'm pretty much obsessed with the place and I want to share all its weird and wonderful details with everyone. For now I’ll spare you the needless description of how I came to live in my house and move on to the import part. The house itself. The house is almost completely original, unmolested over the ages, save for the addition of carpet in the family room and linoleum over the kitchen floor. Beautifully maintained birch wood paneling adorns many of the walls, and gold fleck Formica counter tops stretch across the oversized eat-in kitchen. No beige or granite in site. It’s a thing of beauty. I have affectionally dubbed this place “The Home of Tomorrow.” Besides being a big sci-fi dork, when I first went to look at the place I noticed a small round plate under the address marker. 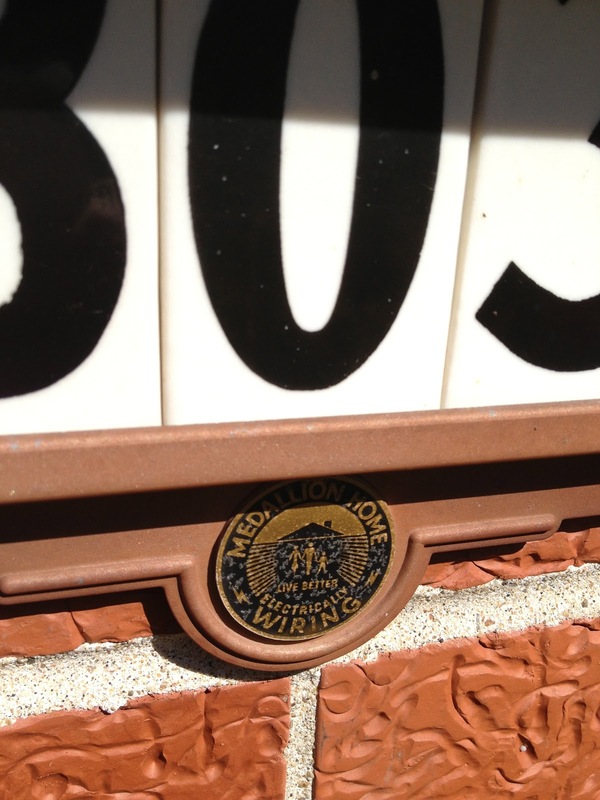 It’s of an adorable nuclear family holding hands in front of a house with the words ‘Gold Medallion Home, Live Better Electrically’ emblazoned on it. I’m pretty sure I made the decision to buy the place right then. I’m a sucker for the retro future tech and that medallion is a big screaming icon to such. 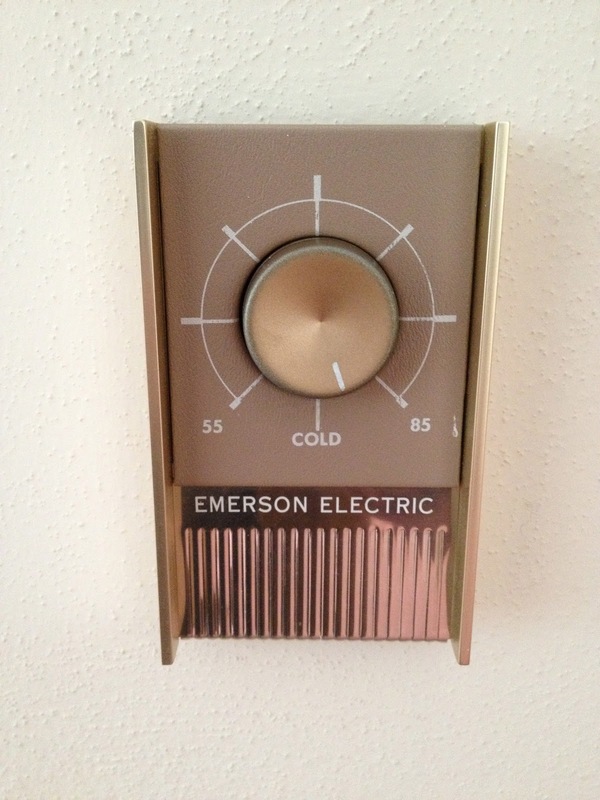 In order for my house to earn the coveted gold medallion— considered the apex of modern living —it had to be a completely electric house. 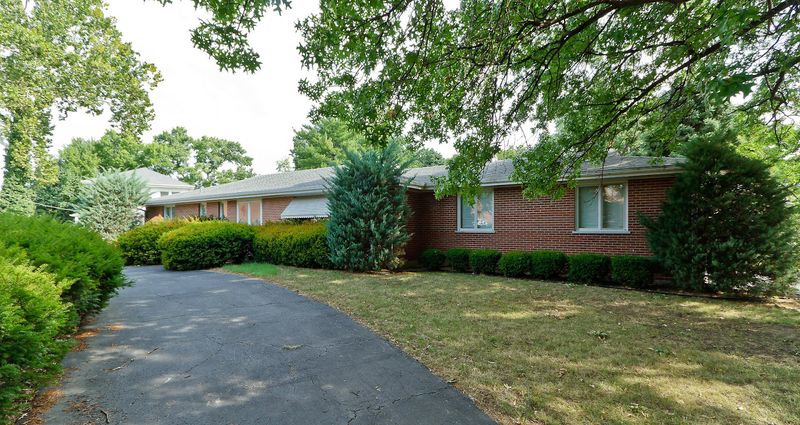 Including clothes washer and dryer, waste disposal, refrigerator and all-electric heating. The heating is one of the more interesting aspects of the place. It has radiant heat in the ceiling. Yes, the ceiling. Before looking at the place I had never heard of such modern marvels of living. Let me tell you, I feel spoiled now. It’s individually controlled, room by room. I don't turn it up unless I’m going to be in there. It’s also not a dry heat since its not heating the air. No more static shocks, no more running a humidifier all winter. I love it. It also doesn't make any noise. So no turing the TV volume up when the furnace kicks on. After seeing my first winter electric bill I can safely say it costs roughly the same as a normal electric furnace.